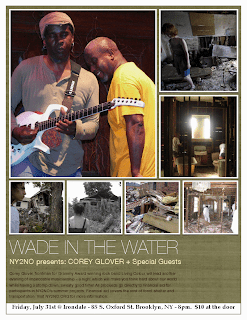 Wade in the Water - featuring Living Colour's Corey Glover & special guests! Former Living Colour bassist Muzz Skillings will be joining Corey on Guitar! Multi-instrumentalist V. Jeffrey Smith! Howard Alper! Callison Strauss! Viva Mayday! + more! On June 28th Corey Glover hosted a fundraiser for NY2NO at Temple M. Vernon Reid, V. Jeffrey Smith, Booker King, Howard Alper, Dean Bowman, Kaila Paulino, and Will Calhoun joined him. If you were there, you know I’m not exaggerating when I say it was one for the books. On July 31st Corey Glover, frontman for multiple Grammy Award winning rock band Living Colour will host another solidarity jam, this time unplugged. This acoustic set will also feature some very special guests. We promise another evening of impeccable musicianship – a night which will make you think hard about the world and your own inner life, while having a stomp down, sweaty good time! All proceeds from this event will go directly to financial aid for participants in NY2NO’s summer projects. Financial aid covers the cost of food, shelter and transportation. Katrina was nearly four years ago. We all watched it go down on TV. Some of us saw Spike Lee's 'When the Levees Broke.’ We watched busloads of pets being evacuated while people waited for days atop their roofs, left to die. Our newscasters on the screen told us white people were salvaging, while black people were looting. We all saw it happen. What most of us aren’t aware of is how much devastation remains, particularly in the Lower 9th Ward. A historical neighborhood equivalent to NYC’s Harlem, which was hardest hit with over 30 feet of toxic floodwaters. The Lower 9th had the highest rate of African-American home ownership in the country. Those who survived were displaced; families were separated in ways eerily reminiscent of slavery. Survivors are still scattered throughout, as far away as Alaska with no means of returning. Families are still searching for each other. Almost FOUR years later.